Root canal treatments are part of the area of dentistry known as endodontics, which deals exclusively with the nerves of the tooth. Root Canal treatments are often recommended when the nerves within the tooth become infected or die, which can cause severe pain. Thanks to advanced developments in root canal treatments, dentists now have the skills and technology available to save teeth without having to resort to the removal of the tooth. At the core of the tooth is soft tissue known as pulp, which is housed in a hollow area that contains a space towards the top known as the pulp chamber. This pulp chamber is connected to the root of the tooth via pipe-like canals, giving rise to the term “root canal”. Occasionally, the internal soft tissue of the tooth becomes infected and this can result in a serious infection if left untreated. 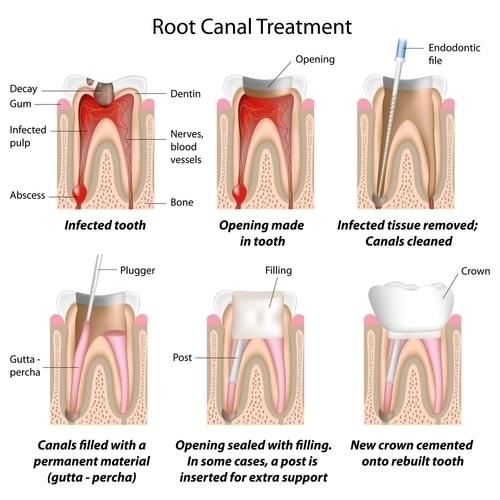 Root canal treatment should take place before the infection becomes to serious, and aims to remove the infected tissue and clean the canals. It’s not always easy to identify what is causing pain around your teeth, but infections in the root of the tooth can be identified as producing spontaneous pain or throbbing while biting, increased sensitivity to hot and cold foods, and severe decay that leads to an abscess in the bone. Spontaneous pain or throbbing while biting. Sensitivity to hot and cold foods. Severe decay or an injury that creates an abscess (infection) in the bone. In order to treat the infection in the root canal, Dr Aisha Ahmed and her team will have to remove the bacteria from within the tooth. Dr Ahmed is trained to perform endodontic treatment on even the most difficult root canals. With a special microscope, she can locate calcified and unusual canal forms and tackle root canal infections before they progress. process, ensuring the infection is completely removed. Once the infection has bee dealt with, the interior of the tooth is filled with an inert material that helps to block the canal from further infection. In around 9 out of 10 cases, a tooth can survive for up to 10 years after the root canal treatment is completed. Dr. Ahmed is trained to perform endodontic treatment on even the most difficult root canals. With a special microscope she can locate calcified and unusual canal forms. Contact us today to set up an appointment for a root canal treatment with Dr. Ahmed. What is the root canal? The root canal is not actually the treatment, but a system within the tooth that contains the soft tissue, or pulp, from the centre of the tooth. The root canal system extends from the crown of the tooth to the end of the root, and as such any infection can cause severe pain throughout the tooth and gum. infection is allowed to develop it can lead to further infection of the gum and even more severe consequences for your overall health. Those who wish to avoid a root canal are likely to face complete tooth extraction in order remove the infection. The root canal is located between the crown of the tooth and the base of the root, which means it is positioned close to the nerves. Unfortunately, this means root canal treatments are often painful and uncomfortable, requiring anaesthetic and pain relief. Following a root canal treatment, many patients choose to use over the counter pain killers to reduce pain, although some dentists will provide short term pain relief. Despite this, the pain experienced after a root canal treatment is often described as favourable to the pain caused by an infected tooth, and post-treatment discomfort is only likely to last a couple of weeks.